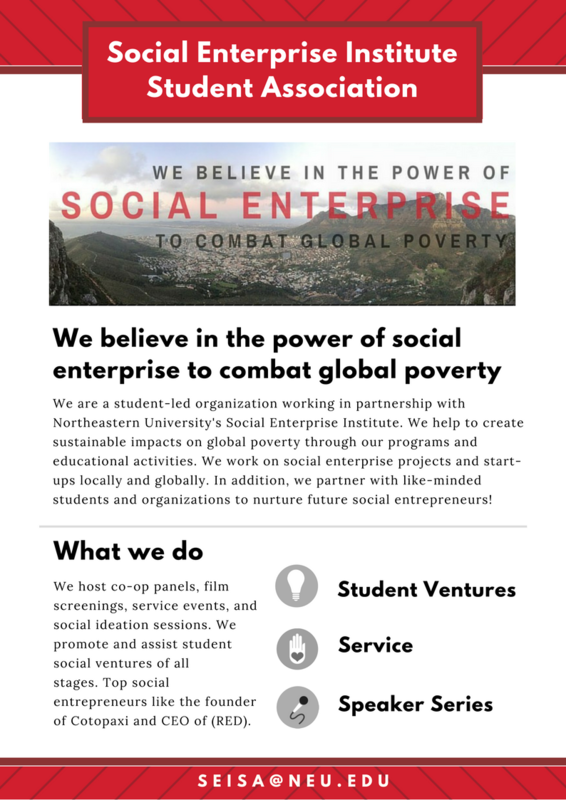 We are a student-led organization working in partnership with Northeastern University’s Social Enterprise Institute. We help to create sustainable impacts on global poverty through our programs and educational activities. We work on social enterprise projects and start-ups locally and globally. In addition, we partner with like-minded students and organizations to nurture future social entrepreneurs! We are dedicated to connecting students who are interested in using business tools and practices to create lasting social change both domestically and abroad. Produce new knowledge in the field through the NU Social Enterprise Review, a scholarly journal on social entrepreneurship. Eat good food and meet new people! Not convinced yet? Hear from fellow students on why they love SEISA!